iFX Expo 2018 gold sponsors ImpacTech welcomed the overwhelmingly positive response of visitors to the launch of ImpactCRM. The Limassol-based FinTech company made a big impression at the biggest financial B2B expo of the year as they launched their cutting-edge data-driven CRM. “Interest in ImpactCRM is beyond our expectations, in fact our full range of solutions were very well received. It’s an endorsement of our R&D efforts and ability to meet today’s widening business needs,” said ImpacTech sales director Anthony Papaevagorou. 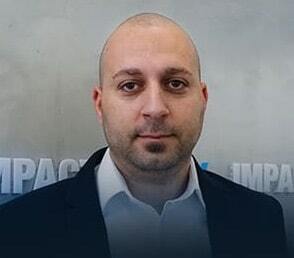 “On behalf of ImpacTech, I’d like to thank everyone who visited our booth, and making this such a successful expo for us,” added Mr Papaevagorou. In addition to demonstrating their end-to-end suite of products at their immaculately presented booth ImpacTech held two prize draws and gave away a Bitcoin – won by Mr. Nissim Agami. In the other draw they gave the winner a VIP table for four at the official expo Night Party which they were also sponsors. On day 1 of the expo Mr Papaevagorou presented a very well attended workshop on Big Data with Artificial Intelligence and its growing influence on businesses today. “Judging by the follow up reaction to the workshop it’s safe to say people found it informative and instructive. Several attendees told me afterwards that it has helped them to plan their company’s immediate road map,” explained Mr Papaevagorou. An estimated 4000 attendees visited this year’s expo which drew 170 exhibitors. Despite the unusually high temperatures (even for Cyprus) the venue was packed. A number of FinTech solutions were demonstrated during the event but few could match ImpacTech’s complete package of integrated solutions. The benefits of combining ImpactCRM with their VoIP solution and Marketing Tools in conjunction with their White Label brokerage solution provides a compelling case for businesses keen to explore the advantages state-of-the-art technological advances in Artificial Intelligence and Big Data.